Let’s get one thing straight. We are not talking about probiotic foods. We are talking about prebiotics. What is the difference? Well, probiotics are good bacteria, while prebiotics are carbs. Prebiotics cannot be digested by the human body. They serve as food for probiotics. In other words, without prebiotics, you cannot get probiotics. 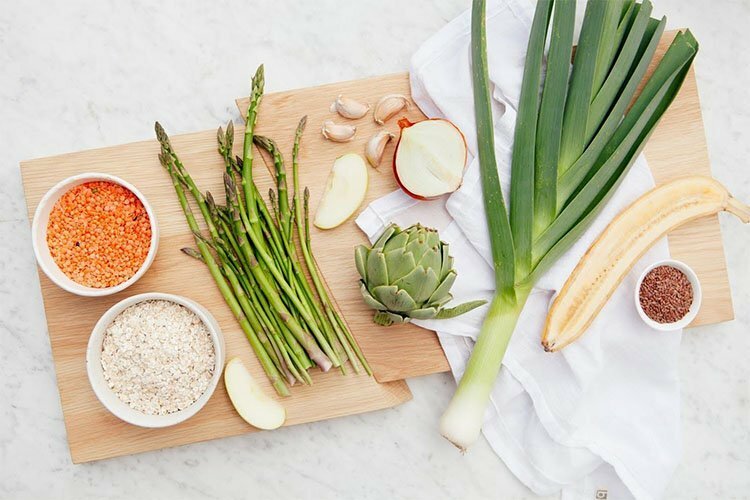 When you do not consume prebiotics on a daily basis, the result is usually an aggravated digestion and higher level of inflammation to the gut. Let’s look at the question more deeply. The definition for prebiotics is “a type of non-digestible fiber compound”. And same as other high-fiber foods, your body cannot fully break down prebiotics. Once they pass through the small intestine, prebiotics reach the colon where they are fermented. There was a time when prebiotics were not classified as fiber compounds. However, recent research shows that prebiotics behave in the same way as other forms of fiber do. How prebiotics work with probiotics? In order to fully understand the benefits of probiotic foods and prebiotics, we must explain the link and connection between these two. To be fair, probiotics have risen in popularity in recent years with fermented foods like kombucha and kimchi. Prebiotics, on the other hand, remain an unknown. How do they work? Prebiotics make their way through the stomach without being broken down. Your gastric acids and digestive enzymes cannot break down prebiotics. However, they bring positive changes to the digestive track. Prebiotics are nutrient sources, or fuel if you wish for probiotics. Together, they allow specific changes in your digestive system to take place. For example, they support the activity of the gastrointestinal system. Prebiotics and probiotics play a key role in preserving health by maintaining a balance of good and bad bacteria in the intestines. There are many benefits of prebiotics, but we will focus on some of the most important. As mentioned in the beginning, prebiotics stimulate the growth of good bacteria. Without them, your body will not produce as many probiotics. The latter then colonize your microflora. In a way, prebiotics help balance the bacteria and toxins in your digestive tract. That alone has many health benefits and implications, but most importantly, improved digestion. When you have good bacteria in your gut, you are able to use the fiber from the foods you consume. In other cases, the fiber would be non-digestible. In addition, changes to the gut prevent digestive problems like diarrhea, irritable bowel syndrome, inflammatory bowel disease, leaky gut syndrome, Crohn’s disease, and many other digestive problems. Many studies have shown that dietary consumption of prebiotics results in changes in the gut microflora. As a result, your immune system is improved. They call it “the prebiotic effect”. This effect has been linked with modulation of biomarkers and activities of the immune system. Prebiotics improve stool quality, including consistency and frequency, as well as reduce the risk of gastroenteritis. In general, they improve your well-being and reduce the chance of allergic symptoms and reactions. One way prebiotics help is by enhancing our ability to absorb nutrients and minerals from the foods we eat. They lower the pH value of your gut, inhibiting the growth of potential pathogens. Prebiotics reduce glycation, a compound that increases free radicals and triggers inflammation. As a result, your insulin resistance is lowered. Prebiotics have a hypo-cholesterolemic effect. In simple words, they improve your body’s ability to prevent ischemic heart disease and other autoimmune diseases. Prebiotics also regulate the amount of electrolyte and mineral levels in your body. Two of those include sodium and potassium, both which regulate blood pressure. By now you know that inflammation is the root of all evil. Most of the autoimmune diseases are caused by inflammation. And inflammation is nothing more than an imbalance in the gut. When you consume prebiotics, you increase your healthy cholesterol levels and lower your risk markers for cardiovascular disease. Since we mentioned that prebiotics improve the digestive system, it is only logical that they reduce inflammation. We mentioned that prebiotics improve the absorption of minerals in the body. That includes magnesium, calcium, and iron. All of these minerals are crucial for the health of your bones. Our body has troubles absorbing all of these minerals, but prebiotics enhances that ability. It is a known fact that foods high in fiber lower body weight. They help against obesity. Prebiotic foods act in the same way as fiber. They give you a sense of fullness, and regulate your appetite. Many experts suggest that the source of depression, anxiety, and similar mental problems should be looked in the gut. Your mood and hormonal balance is first and foremost affected by the gut flora. Your gut absorbs and then metabolizes nutrients from the foods you consume. Whether your body facilitates neurotransmitter functions that support hormone production (like serotonin) or not, depends solely on the foods you consume. Some foods support serotonin production, others create inflammation in the gut. Prebiotics are important because they belong in the former category. Dandelion greens are leafy greens that you can add to almost any salad. Or you can eat them raw. For more on food and healthy habits, check this article on food that actually makes you hungrier.